Handy Art® Washable Tempera Markers are great for letting little ones express themselves. Create posters, banners and craft projects. Draw lines or dots with ease! No need to clean brushes, when you're done just put the cap back on. Handy Art® Markers have pressure sensitive valves which ensure paint won't spray out when squeezed. Empty bottles can be refilled. 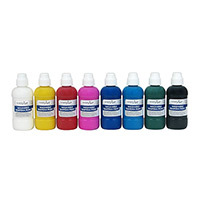 Handy Art® Washable Tempera Markers are certified AP non-toxic.